In the last in our series, Dave Walker, Technical Director, Mining & Minerals discusses the initiatives that can optimise water consumption and conservation at mines to reduce their need for water. He also gives some examples of worked carried out by teams globally. There are several avenues open to mine water use optimisation, which go a long way to reducing water consumption and minimise impacts on water sources that may be under pressure. The simplest and most widespread is the separation of clean and affected water within the operation according to current best practices. Simply put this is the separation of clean and dirty water as far as is practicable. This includes the shedding of unaffected storm-water before it mingles with site water. It includes the capture of otherwise clean water in settlement ponds to reduce stream turbidity before release. It includes the collection and use of relatively clean, but affected storm-water within the mine, plant or waste rock facilities and harvesting as a source of relatively fresh process water. It can also include the capture or interception of dirty storm-water, spills or leaks within the process plant, as well tailings return water. Making use of water derived for open pit dewatering or underground water abstraction is a handy source of fairly fresh water for mineral processing, dust suppression and other uses, but is not always entirely reliable over the life of a mine so can only ever be a partial supply solution. 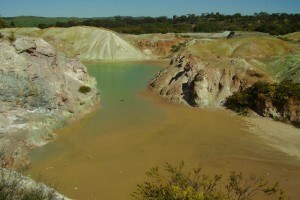 The biggest consumer of water on any mine site is the mineral processing plant and the single biggest opportunity for minimising water loss (or conversely, fresh supply) is the tailings management facility. However, it is a lot more complex than the simple recycling of tailings return water or dewatering (partially or otherwise) tailings before depositing. In any closed or partially closed process circuit there is a build-up of chemicals and mineral constituents that are deleterious to the process impinge on operational efficiency and/or affect longevity of mechanical equipment. These have serious cost implications on several fronts and despite the cost aspect of treatment have diminishing returns before fresh make up water is essential. The unintended consequences include additional waste streams or sludge to handle and manage, which could include waste streams with potentially high toxicity due to concentration of minerals and chemicals. Innovation in mineral processing, water treatment technologies coupled with environmental (water) management is where path to innovation lies. In other words, whilst there may be further technological answers, the true path to conserving resource and minimising water related impacts lies in the integration of engineering and technology with hydrological and environmental sciences, a central theme to SLR’s core business. SLR has performed water balance analyses for a series of aggregate mines in Southern California to demonstrate how future water demands can be met under every increasing competition for limited groundwater supplies. These analyses demonstrated how demand could be reduced by increasing the efficiency of the water uses, such as dust suppression and wet screening of the product; and how water losses associated with the fines disposal could be reduced by lining the fines disposal areas with either artificial liners or over time, with the fines themselves, and how the application of pressure or belt filtration equipment could be used in increase fines water recovery. SLR has also been providing expert review for a diamond mine in Namibia where water supplies were becoming a critical issue. Over time, in conjunction with the mining company, SLR was able to establish tailings deposition procedures that halved the amount of water lost in the tailings facility. This has been accomplished by changing the tailings depositional scheme to discharging into several smaller constructed tailings cells, instead of as originally operated, the entire tailings facility.